Here are the 81 correct answers to STAND... BUY ME, the prize game of 2nd edition of International Showcase Open Street. WARNING: unfortunatley, out of 72 forms delievered to showcase desk, only 37 have been collected by Open Street staff, 35 of them have never be delivered. This makes it impossible to determine a winner for his edition. WARNING: The following company have declined to participate in OPEN STREET SHOWCASE 2011, due to unexpected commitments: My!Laika (FR) for the Over Medium category. This company are replaced by immediately following and available proposal on official ranking of interest. 4 BUNDESVERBAND THEATER IM ÖFFENTLICHEN RAUM E.V. Dear companies joined to OPEN STREET EUROPEAN FORUM, we wish to thank you for ample interest shown to OPEN Project, also this year. In 34 days of web platform opening, we have collected about 210 new registrations and now OPEN STREET is a Network formed by 670 members from 34 countries (9 registrations of non-European countries). The applications for the official programme of showcase are 244. At the moment more than 115 European Festivals representatives and other art operators have decided to subscribe the proposal of cooperation. Actually, these results shape the project into a significant experience, giving to all of us the opportunity to support, thanks to street performing arts, the building of an European cultural identity. Oct. 18th 2011 it was the application deadline. The voting of videos by the festivals jury, for 8 categories, is still on way and it can be trailed in real time on web page OPEN STREET TUBE. We will inform you about end outcomes within September 22nd. On that occasion we will ask you to confirm your attendance to official programme to showcase (in case of selection), to the Off section of showcase (if you received one of 30 best scores among non-selected), or attendance just with promo desk. 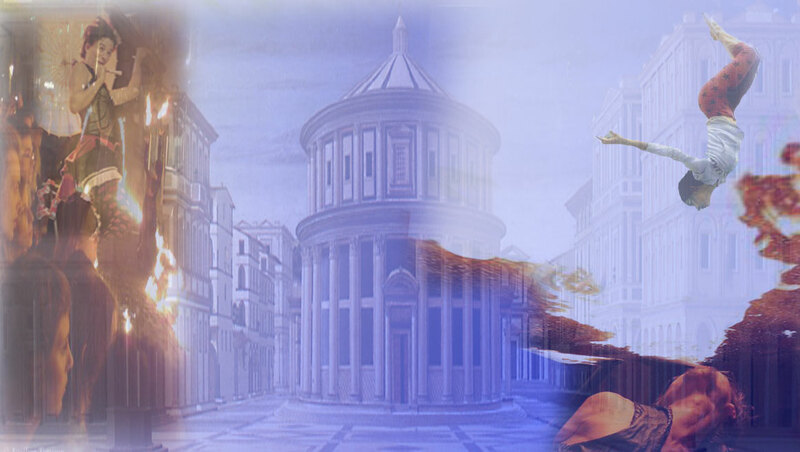 Later, you will receive all info concerning your stay in Fermo. Once again it was demonstrated that the Street Performing Art can join Europe. 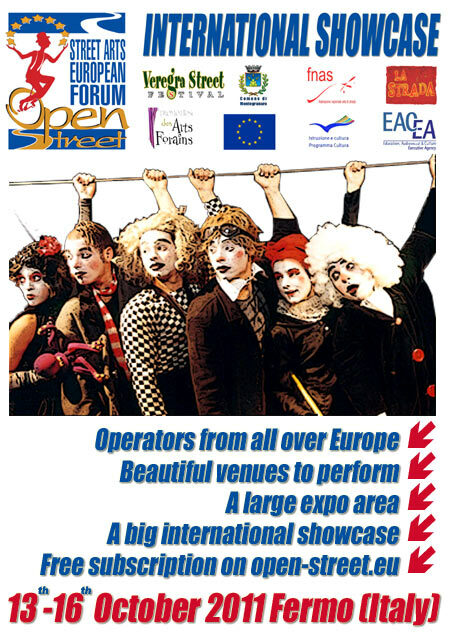 - To create an European market of the street show that is attentive to the cultural specificities of each country on the continent. - To promote the construction of a European identity of popular show as an element essential for the integration of member countries. - To promote the development of open network of institutional relations and trade relations between artists, companies, operators, festivals, programmers, etc. ..
1) SHOWCASE open to all artists, companies, promoters of Europe, with registration booth and free availability of meeting point, audio and video screening rooms, internet desks, accommodation at agreed price . 2) PROGRAM 20 shows in small, medium and large events, selected by a group of members of the Open Forum Festival, with companies from different countries, and recipients of attendance fees proportionate to the complexity of the trip. 3) OPEN STAGE evening with the opportunity to perform before an audience of qualified professionals, until a maximum of 30 artistic proposals, prioritizing those who received the highest score during selection referred to at point 2. Participation is completely free for Festival and Companies. The hospitality in partner hotels is priced at € 25.00 per person per day. Meals (lunch and dinner) in the affiliated restaurants is priced € 10 per person. Registration must be made through the website www.open-street.eu. The organizers of festival joining OPEN STREET commit to insert in the next edition of their event 1 show to be chosen among those selected for the official program of showcase and 1 of other shows of showcase, matching the price range of category in which companies have signed up (+ travel expenses + accommodation and meals). Click on button "join" and fill the online registration form (as artist or festival…). Once registred, you will receive an email with a link to be clicked: this will complete the registration procedure. Enter to your area whit username and password and fill the participation form (on "your showcase" button in top blu bar). Now, if you are artist or company, you can participate to selection for official programme by inserting a link (embed code) of a max. 10 minutes video of your show. If your video is not selected you will benefit of bargain accommodation fees, free availability of promotion desk, video room, open stage, meeting point etc. If you are festival you can vote european show candidatures on OPEN STREET TUBE.